Works great for hobbies ! At first I thought it wasn't going to be sturdy enough , but I was wrong ! Works great for all my beading projects ! Love it ! Yes, I would buy again! I use this lamp close to my chair for sewing, reading, etc, very handy with no cord. This product is so convenient to use any place you need extra light without having to worry about having an outlet to plug it in. my husband uses this by his chair when he does his wood carving. he loves it. i love this product. quality was great. I was impressed with the light intensity. I use this lamp as an added light at my table when working a jigsaw puzzle. I use this lamp as a portable light source while working on craft projects. It is very handy as it is powerful light that is not limited due to lack of power outlets in the areas of use. 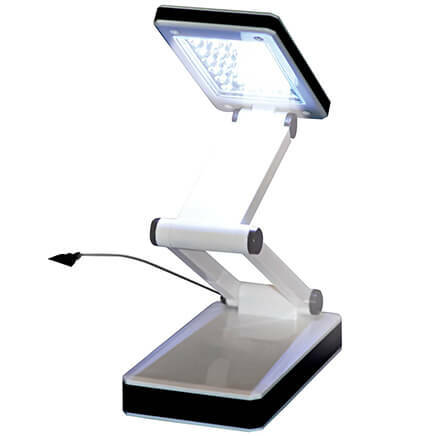 This lamp is great for reading and can be moved around with ease. It is also great if your lights are out during storms. Lamp gives a comfortable dose of light for a large room in case of power outage. So nice to have when repairing something small on the coffee table or just having brightness close up, hands free, while in your lazy chair and needing extra light for a small task. I wanted a battery-operated, small light over my puzzle table so not to have to move cords around. This works great, including focusing on smaller areas where you are working! Bought this for our tent. It works beautifully. Gives enough light for a 10x20 tent. I read using it. I see using it. I have even used it to put on my makeup. Very light to handle and move around. Plan to use it for crafting and close work such as puzzles. This will be a great thing to have when the electricity goes out and I am able to read by it without any problem as well as work crossword puzzles. For the price I think it is great. Can move it from room to room as needed and I am a senior citizen. We have a cabin that has no electricity -this is an easy, lightweight lamp that can be placed any where needed at night- to read by, play cards or just add ambience. We ordered another one and are very pleased with them. I would buy the anywhere lamp again. We use it by the desk. It's really nice and helpful. I purchased this product because we had lost electriciy several times close together at night. I thought it would be good to use at times like that when I would like to read or do my counted cross-stitch. This is just what I needed to read at night. We have high ceilings and because there is no outlet it's hard to read late at night. This lamp works great and I can move it from room to room. Well worth the price. I am so pleased with my cordless floor lamp. I have 3 and may want more. It is bright, direct, light in weight and used daily. Bought one of these lamps several years ago. It too fell after a couple years, however, from the switch part up was not damaged and made a very nice table lamp that I used for many more years. So, don't just throw it away when the stem breaks. Use the top as a table lamp. The top just gave up, so I'm ordering another whole new lamp. Hope this helps someone. simple to assemble. bottom is weighted down so it will not tip over. setting it on a carpet isn't very sturdy, but I just realized that if I put a piece of wood or other sturdy material underneath it, it would keep the pole more sturdy. as far as the brightness, it takes 6 AA batteries, but the bulbs could be a little brighter than they are. but I really bought it for standing over our rolling table cart for us to play games on when the electricity goes out. since theres not much to do in the dark. and with this lamp, we would be able to see each others faces and socialize visually. December of 2016 we were without electricity for 2 full days and nights. the touch lights were good for getting to the bathroom and other rooms, but not enough light to play games under etc. and this floor lamp can be positioned perfectly over a table to do projects or hobbies or play games. i would like one in every room. once our electric goes out, everyone bonds together in the living area. this lamp is a great convenience. Good lightweight lamp you can move where you need it. Great for reading, card games, jigsaw puzzles, projects, etc. Power out ????? I am not!!! Have given this product to several of my friends. I do this all the time when I really like a product - this lamp is so versatile and easy to transport wherever needed at the time. I love it. Received this lamp just in time to give me light when the electric went off due to a snow storm. I was going to give it for a gift, but now I'll buy another one for that and keep this to use as it is intended to go anywhere, but also serves well in times of no electric. no cord - love it . works well - good light - only problem - my first one tipped over and the plastic light lens cracked - some light broke - I like it si much I bought another . Good for only a small area like sitting in a chair to read. Very lightweight and easy to use and assemble. I use the lamp for my Japanese embroidery which requires good lighting. This lamp is great as I can move it around and there is no troublesome cord. There is no need for an electrical outlet too. Thank you. It is good for additional light at night. Being battery operated, makes it easy to move around the room..
the power goes out often here and this is also cordless which is a plus for a small apt. The best part of this item is that it is portable. It would be useful for a small area but not a large one. Light isn't as bright as I'd like. I bought this to use during power outages. It will work for that, for limited use. It's light weight and easy to use and it's very movable. However, it does not give off that much light. If you have tired eyes like mine you probably should pass. Would I recommend to a friend or buy another one - No. The light is so dull that I cannot read a book by it. It's only good for looking for stuff that I can't locate easily. This lamp was great whenever the lights went out, which was often. It was light to carry and gave off alot of light, better than a flashlight. And when you got to where you were going, you just stand it up and see whatever you need to see. However, it does tip over easily and finally fell and broke. I'll probably buy another one soon. Wanted to use this lamp to light needlework in my lap. it started out bright but is dimming with use of 2 days. Assembly was simple but cheap materials and fell apart more than once making putting together difficult. Have to be careful about moving it or it will fall apart again. The lamp is convenient, because it is so light to move around, will be helpful when directed to a specific spot, however, most flashlights put out more light. I'm very disappointed with the brightness of this lamp and what's more interesting is that it was even dimmer when used with a dc plug, which I thought came with the lamp. I'm contemplating returning it. Disappointed that this light was not brighter. Easy to assemble, but light is not very bright. I would not buy again. This lamp does not put out enough light for reading or sewing, I intended to return it to Miles Kimball, but the postage was over $16 so I kept it but really have no use for it. I use it as a reading lamp. 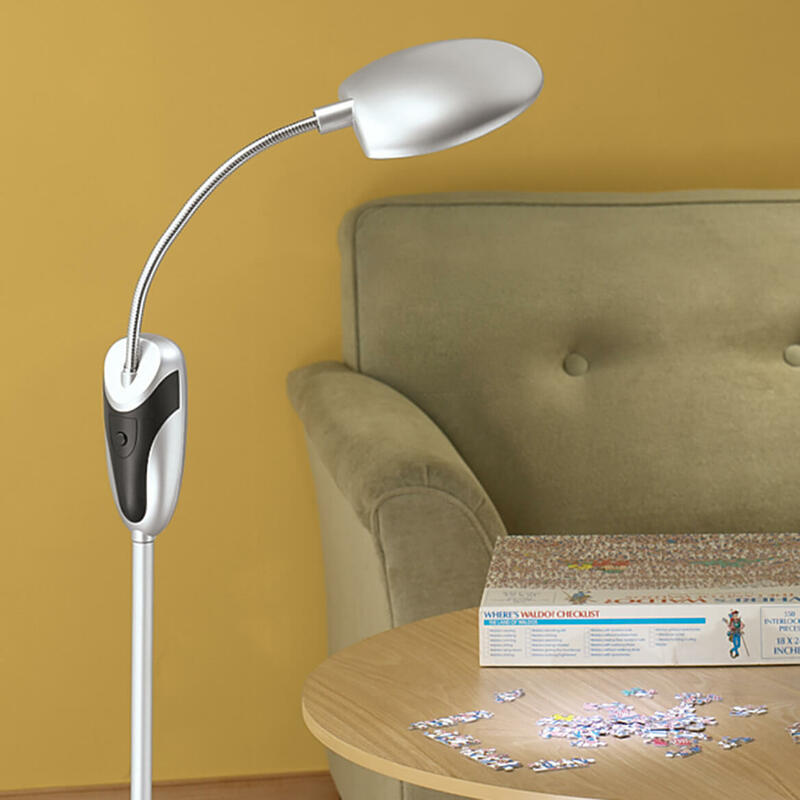 I wanted to use this lamp to do puzzles in my living room. I thought it would be convenient, easy to use and just the right height. It is all of these things, but it isn't bright enough. I am constantly moving it around, trying to get the light where I want it, but never really doing it. weight. Still too light in the base. Not nearly enough light to work by. Have to have light directly over my lap. Light seems to fade fast. Should include the adapter because it works better with one. I could not assemble correctly due to parts did not fit together correctly. I REALLY THINK THIS ITEM WILL COME IN HANDY DURING A POWER-OUTAGE, AND YOU CAN JUST PICK IT UP AND MOVE IT WHEREVER YOU NEED IT AND IT CAN STAND ON ITS OWN !! I chose this for convenience when I need extra lighting for sewing and doing crafts. Hope it works. Looks like a convenient way to use lighting in any location in my home. 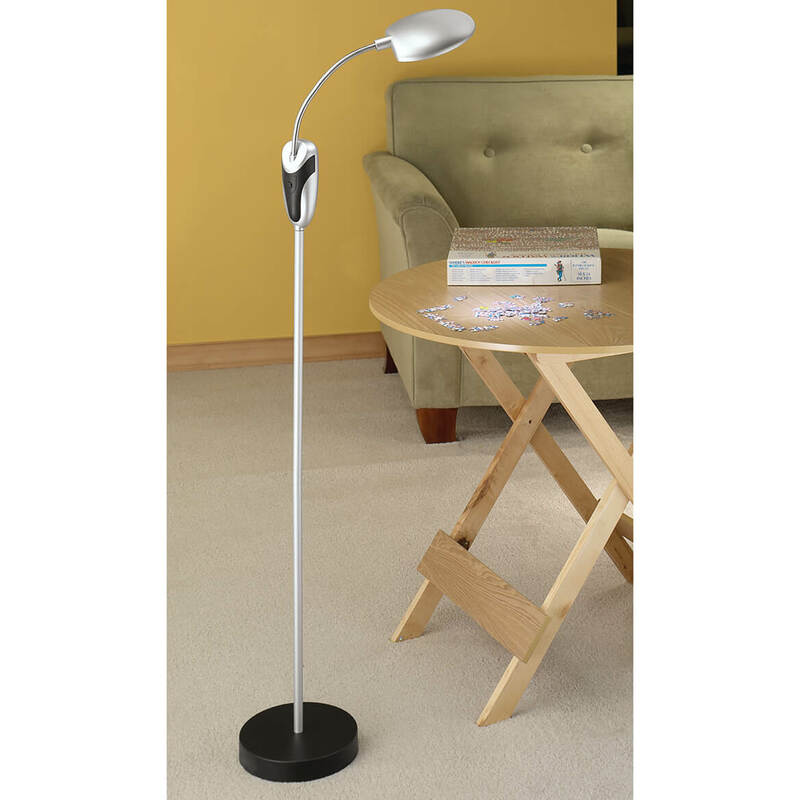 Wife needed a cordless portable floor lamp to carry from place to place, as she works around the house. Couldn't find anything similar in town. This is the beginning of our hurricane season and this low profile battery operated floor lamp is perfect for extended power outages. Saw it in your catalog. I have one already and it is very helpful during power outages. Wanted to have an emergency light for black outs. because its easy to move. my lamps do not produce enough light in the great room. Live in Florida and just went through a hurricane. This item looks like it would be better to use when reading than a camping lantern when the electricity goes out. Something to give me more light over recliner. No electricity in bathroom. Hoping this light will work. Seemed to be what I needed! The lamp is advertised as cordless and appears to be compact. for my crafts and sewing . I needed a lamp I could move around without a cord to stumble over. Comes in handy when the power goes out. Exactly what I wanted and good price. We were looking for a lamp that we could put on our balcony for those evenings when we are grilling. Slim cord-free lamp with LED lights is just what I need to use in bedrooms where there is not enough light or many electrical outlets but where occasionally I need more light. Flexibility to move lamp around to where light is needed, even temporarily. Tired of tripping over a cord for a lamp. because it can be moved around anywhere and I do not have to find a plug. It is comforting, when the electricity goes out. I like that it is cordless and therefore ;I can move it where I need it . Need some light over my shoulder without the hassle of electric cord as have a small apartment. I have not seen this lamp advertised anywhere else. I need a lamp by a recliner that is not near an electrical outlet. I hoped it would help see the buttons on the remote but it is not very bright. Who is the manufacturer of this lamp? Adjusts to 51 1/2" high, but how low in height can it go? BEST ANSWER: Thank you for your question. Unfortunately we do not have that information. We hope this information will be of help to you. BEST ANSWER: This lamp was purchased for my mom who is over 90 years old. She mainly wanted it as a backup in case the electricity went off. In answer to your question, we both agreed that it certainly is bright enough to read by this lamp. Is there replacement LEDs available? BEST ANSWER: Thank you for your question. We do not carry replacement bulbs for this lamp. We apologize for any inconvenience.